1)Research status of high temperature piezoelectric ceramic materials: SiO2 is one of the earliest piezoelectric materials applied to devices. Due to its stable resonant frequency and good temperature stability, it is widely used in production control and management of all communication system. In components, such as clocks, microprocessors, etc. Lead bismuth citrate (PN) has a tungsten bronze structure, low mechanical quality factor (Qm) value, high ratio of d33 to d31, and is widely used in non-destructive testing (NDT) and medical diagnostic fields. 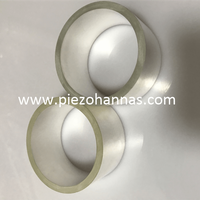 Lithium niobate (LiNbO3) and lithium niobate (LiTaO3) are similar in structure and performance, and are often referred to as crystals having a lithium niobate type structure. With good piezoelectricity, pyroelectricity, ferroelectricity, electro-optic and nonlinear optical properties, it is widely used to fabricate high temperature transducers, filters, pyroelectric infrared detectors, laser modulators and A variety of functional devices such as frequency multipliers. 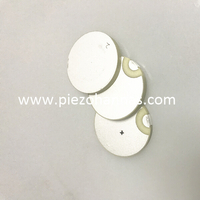 2)Piezoelectric ceramics are actually a polarized ferroelectric ceramic with piezoelectric effect, which is a piezo ceramic material piezo cylinder ceramic transducer with mutual conversion of mechanical energy and electrical energy. Using piezoelectric ceramics to convert external forces into electrical energy, piezoelectric igniters, mobile X-ray power supplies, and projectile detonators can be fabricated; piezoelectric ceramics can be used to convert ultrasonic energy into ultrasonic vibrations, which can be used to find the position of underwater fish. And shape, non-destructive testing of metal, ultrasonic cleaning can also be made into a variety of ultrasonic cutters, welding equipment and soldering iron, processing plastics and even metal. Piezoelectric ceramics are very sensitive and can convert extremely weak mechanical vibration into electrical signals. The sensitivity can even sense the disturbance of the flying insects flapping their wings for more than ten meters. It can be used for sonar systems, meteorological detection, environmental telemetry, earthquake prediction. 3)Piezoelectric polymers of piezoelectric discs ceramic transducers are considered to be ideal materials for robotic sensors. It has the characteristics of wear resistance, light weight, high sensitivity, low acoustic impedance, easy to fix on complex surfaces, low price, and wide frequency band. Sensors that use piezoelectric functions include tactile sensors, acceleration sensors, and proximity sensors (distance sensors). Sensors that use pyroelectric functions include proximity sensors (safety sensors), contact sensors (distributed), material identification sensors, and infrared cameras. 4) The application of piezoelectric fiber composite materials have structural vibration reduction, piezoelectric fiber composite materials can be designed from the sensing driver and applied to the frequency response identification of the beam. This material is used in the damping system of the aircraft's vertical tail in order to suppress the vibration generated during flight and to test the performance of the piezoelectric fiber composite in the active control of the tail vibration. The test results show that the material has good sensing and driving performance, and the damping effect is better than that of piezo ceramic transducers. 5) Application of ultrasound cylinder ceramic transducer in self-powered technology of microelectronic devices. Due to the unique electromechanical conversion characteristics of piezoelectric materials, many energy harvesters use piezoelectric materials (elements) as energy conversion and output components. By compounding with other material mechanisms, piezoelectric materials can also convert energy forms other than mechanical energy into electrical energy output for multiple forms of energy harvesting. Piezoelectric materials in flexible structures are widely used in vibration, measurement and control at an increasing speed due to their unique properties. On the sensing and control side of smart structures with an integrated control side system, piezoelectric materials are utilized. The accurate response monitoring of the flexible structure can be easily obtained, so that it can be effectively controlled. 6) Piezoelectric transformer is a solid-state electronic device based on piezoelectric effect. It utilizes the positive piezoelectric effect and the inverse piezoelectric effect of piezoelectric ceramic material to complete the mutual conversion between mechanical energy and electrical energy, and realize the high and low voltage conversion. One of the most typical applications of piezoelectric transformers is to drive CCFL (cold cathode fluorescent lamp). The DC-DC converter is much lighter than the traditional electromagnetic transformer, and the energy density and efficiency can be greatly improved. The electric transformer has the advantages of high power density, high current isolation, low electromagnetic interference, etc., and can replace the electromagnetic transformer in some application fields. Make full use of its advantages, not only can realize the miniaturization of the converter, but also solve the existence in the power electronics. Electromagnetic interference (EMI) issues. 7) Piezoelectric actuators are devices that use mechanical inverse effects to form mechanical drives or controls. 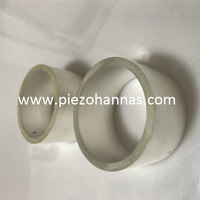 Since the ultrasonic polarized piezo transducers have the advantages of fast response, high precision and anti-interference, the driving and control device constructed by the piezoelectric body has a simple structure and a quick reaction. The piezoelectric driving and control device which has been developed at present mainly includes an ultrasonic motor and a precision.etc., and have been successfully applied in many fields such as defense, biomedicine, and optoelectronics. The role of piezoelectric materials in smart material systems, such as piezo ceramic actuators, which can also be used as sensors in smart material systems and structures. Because piezoelectric ceramics and piezoelectric polymers is measurable electrical signals for applied stresses. 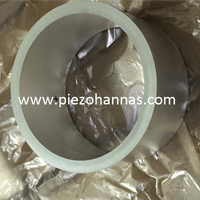 An important application of piezoelectric fibers is the fabrication of piezoelectric fiber composites (PFCs), which are a combination of sensing and driving. The adaptive structure of intelligent materials systems and structures is one of the features that can be adapted.it is the realization of structural shape and vibration control. This is vital to aviation and spacecraft. Piezoelectric fiber composites (PFC) provide a good material for adaptive structures. As well as damped noise reduction applications, in order to achieve miniaturization of sensors and drivers and to make complex shapes, it is desirable to incorporate technologies in the semiconductor industry, such as lithography. In order to make the lithography easy to perform on piezoelectric disk elements, it is possible to incorporate a polymer material that is easy to repair with ultraviolet rays into a ceramic tape casting process, which may be used in a ceramic laminate structure prepared by a smart material system.The combination of sensing and driving functions with the control system can be used to deposit an electronic ceramic film on a silicon integrated circuit. 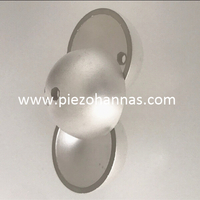 Piezoelectric materials have been widely used in information, biology, military and new energy fields. With the development of modern science and technology, the continuous improvement of piezoelectric materials technology, it is believed that piezoelectric materials will spread to every corner of people's daily life. Moreover, the preparation technology and application development of piezoelectric materials will continue to be a hot topic of concern.